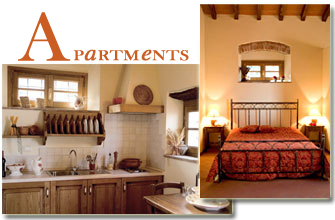 The "Rocca del Maestrino" has seven self catering apartments for a total availability of 28 persons. Every single apartment is completely independent, has satellite TV, air conditioning, heating, well-equipped kitchen and Tuscan style furniture. Extra bed and/or cradle are available on request. The laundry mat and a wonderful terrace with a panoramic view Pistoia all the way to Florence are the common spaces that guests can benefit.